Prepare noodles according to package directions. Meanwhile, heat vegetable oil in a deep skillet set over medium-high heat. Season beef with salt and pepper; brown in batches and transfer to a plate. Add garlic, shallots and mushrooms to the skillet; cook, stirring, for 5 minutes. Add vegetables to the beef; tent with foil. Whisk broth with red wine, cornstarch and tomato paste until smooth; add to skillet. Bring to a boil. Simmer, stirring often, for 10 to 15 minutes or until thickened. Add cream, beef, mushrooms and asparagus; cook, stirring, until just warmed through. 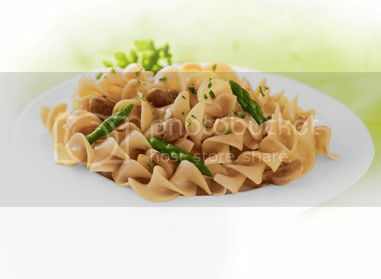 Serve over prepared noodles; garnish with parsley.